The Midnights was a deeply moving book about grief and our struggle for re-invention grounded in a vivid musical atmosphere. The Midnights is a book where the music comes alive. Susannah deals with grief, unanswered questions, and this struggle to figure out who she is. In the background she finds our family secrets and has to question her friendships and actions. While I really loved Susannah’s character, I was deeply intrigued by the characters of her family. This book is definitely focused on Susannah’s journey and discovery-process, but at the same time, she finds out new sides to her own family. It’s almost like in this book she not only discovers who she wants to be, but also re-discovers her own family – including her father. There were many times in the book where I did not know ‘whose side’ I was on – whether that was between her mother and her father, her mother and Susannah, or her and her friends. Susannah is a character I could really empathize with. She’s introspective and is desperately needing this new start – a way for her to act in the ways she never thought about before. At the same time, Susannah has to ask herself if that is truly who she wants to be. I think because of how deeply I identified with Susannah, it made the ending even more sweet to me – real tears were shed! She makes mistakes I made, she gives too much of herself in the gave of giving everything you have to someone, all while trying to figure out what is wrong with her. Her relationship with her mother was fantastic. There were so many parallels between mother and daughter – their realizations, and the ways their relationship has to change after the death of her father. The book is lyrical, tender, and moving. There’s a very obvious passion for music in the book. It beats in the background reminding us of the rhythm and our roots. It is a book that can deeply touch you if you let yourself be carried away by the music. You’ll emerge on the other side different than before. 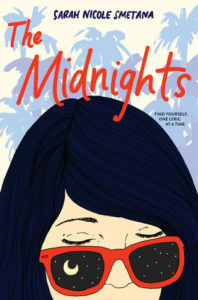 Make sure to go check out The Midnights on Goodreads.